Curtain airbags are located along both sides of the roof rails above the front and rear doors. They are designed to help protect the heads of the front seat occupants and the rear outboard seat occupants in certain side impact collisions. The curtain airbags are designed to deploy only during certain side impact collisions, depending on the crash severity, angle, speed and impact. The curtain airbags are not designed to deploy in all side impact situations, collisions from the front or rear of the vehicle or in most rollover situations. Following are a number of safety points concerning this system which should always be observed to ensure risk of injury is reduced in an accident. o Before installing child restraints , always refer to “Child Restraint System” section to ensure correct installation and that occupant protection is maximized. o Make sure that the occupant does not have any body parts (head, arms & legs) protruding outside the restraining system. An inflating airbag that strikes an infant or child could cause serious injury. o Ensure the opening for the Curtain Airbag System remains unobstructed at all times, so that the airbags can inflate properly if needed. 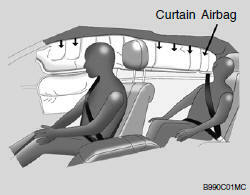 o The space between the occupant and the curtain airbag must never be occupied by children, passengers or pets. Occupants should never lean out or have any parts of their body protruding from the window while the engine is running. o Do not move the sun visor out to cover the side window if there is an item attached to it such as a garage door remote control, pens, air fresheners or the like. These objects could cause injury if the Curtain Airbag is deployed. o Do not install sun blinds to the rear doors, these must not obstruct or impair the airbag in any way. o Do not install any accessories or children’s toys in the Curtain Airbag deployment zones, as this may impair the operation of the system or throw parts of them into the vehicle cabin causing injury to occupants if the system is deployed. o To maintain the integrity of the Curtain Airbag system, any work, removal or installation of the airbag and associated components (such as roof lining and side trims) should only be performed by an authorized Hyundai dealer.